Junior Morgan Noe, a member of the Get Busy Livin' (GBL) Club, converses with a Special Olympics athlete before awards. 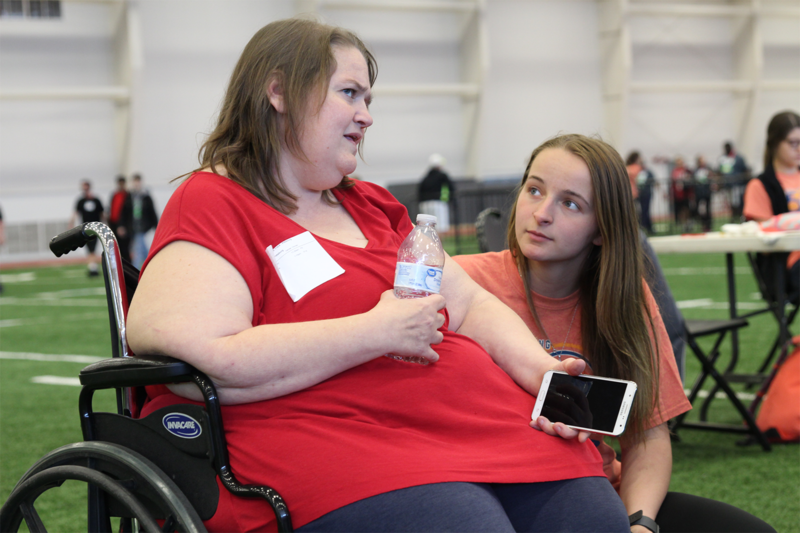 Noe, as well as 18 other members of the club, volunteered at the Special Olympics Track and Field tournament on Thursday, April 18 at the Robert Plaster Center's indoor football field. "I've gotten more experiences with the club," Noe said. "I've gotten to help the community and give back, which is what GBL is all about." Last Thursday, junior athlete Joel Kafka boarded a school bus to the Robert Plaster Center’s indoor football field. But this time, he didn’t come to jump over track bars or throw a football across the field. Instead, he stood on the sidelines and high-fived Special Olympic athletes as they threw plastic javelins across the field. Kafka was one of the 18 student volunteers from PHS’s Get Busy Livin (GBL) Club at Thursday’s Track and Field Special Olympics. English teacher Abbey Cummings, weights teacher Tom Nickelson and health teacher Darin Kelley started the community service club last year to share the legacy of Dylan Meier — a former PHS student, quarterback and substitute teacher who died in a hiking accident at age 26. “Get Busy Livin’” was coined by Meier and inspired the Dylan Meier Get Busy Livin’ Foundation, started by his parents in his memory. The foundation donates scholarships, hosts shoe drives and supports the GBL Club. The Special Olympics was one of the many volunteer events the club’s members have planned and participated in this year. 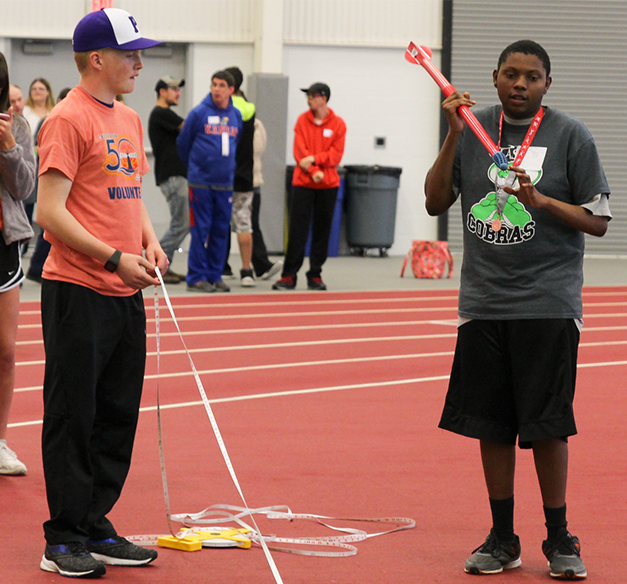 Freshman Cole Jameson, a GBL Club volunteer at Thursday's Special Olympics, hoists the measuring tape as a Special Olympic athlete prepares to throw his javelin. The measurements were used to determine placings for the javelin throw. The Special Olympics is one of the many community service events GBL members have participated in. The club members meet every Thursday morning to plan events. They’ve packaged food for Wesley House, volunteered at Habitat for Humanity’s Spaghetti Feed and cleaned the weights room at the YMCA. In addition to helping the community, the club members have helped their classmates. Back in January, senior Jhalani Long and his family lost their father, Ronald Long, to an illness. At a meeting, Kafka got in front of the club and shared his idea of helping the family. “Jhalani played sports with my brother ever since they were in elementary school, so I just knew there was something we could do to help out,” Kafka, the club’s treasurer, said. The club members brainstormed and decided to host a raffle. They sold $5 raffle tickets during every game leading up to the Sub-State Basketball Tournament and raffled off the various donations they received — including gift cards, statues and sideline passes for Pittsburg State University football games. They raised over $1,000 and donated it to the Long family. Next year, the members plan to launch a new program: Dragons Helping Dragons. They’ll work at four concession stands, which Cummings said will raise approximately $2,000, which will go toward PHS students in need. Sophomore Shay Mahnken, secretary of the GBL Club and former neighbor of Meier’s, said the club’s emphasis on helping people was ordinary for Meier. Meier also traveled the world. He spent time in New Zealand, Russia and Spain. In New Zealand, he navigated the Tasman Sea, with two elderly sailors he had just met. To commemorate his traveling spirit, the club members who have completed at least 20 hours of community service will be eligible to attend a day-long “adventure” at the beginning of June. Club members will be designing an obstacle course for the foundation’s upcoming 5K race, which will be held on May 5 at Hutchison Field. Kafka said the course will be designed in the shape of a nine, Meier’s football jersey number. Cummings said there is one lesson she wants her students to take away from the club.